Celtic manager Ronny Deila insists he is not worried about his future after his side's lead at the top of the Premiership was cut to three points. The league leaders lost 2-1 to nearest challengers Aberdeen at Pittodrie. "I'm not thinking of that," said Deila when asked if he was concerned. "I'm thinking of training the team and I see a lot of talent there. "I know we're going to get better and I know also that, still, we are in a very good position to do good things." The Norwegian says he is "used to" questions being asked about his position but maintains his focus is on working with the squad. "What I'm thinking about is winning the title and working everyday to improve the team and that's what we're going to do," he explained. "There's a lot to play for. Everything is in our hands and we're going to fight to the bitter end to get this title. "I'm confident that we have the skills in the team to do that but it's going to be tough because Aberdeen is getting better and we have to give credit to them as well. 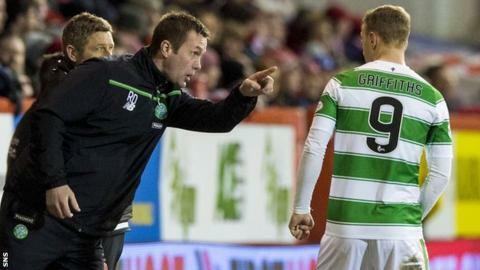 "We didn't score early enough, it was too late when Leigh [Griffiths] scored. "Inside the box at set-play, they get a couple of opportunities where we need to be stronger. "We should have used [Colin] Kazim-Richards even more because he is strong and he kept the ball up for us and we created some chances through that but it was not enough to win."